Qatar has signed a contract with US engineering giant Bechtel to build a new airport for its capital Doha. The scheme is expected to cost a total of about $5bn. Passenger handling capacity will be boosted to 12m when the first phase is completed by 2009. Last year, Qatar Airways signed a deal to buy 18 Airbuses with options on 14 more at a cost of £3bn. The Gulf state plans to boost tourism and hopes to draw duty-free shoppers on routes linking Europe with Asia. "The airport will be one of the biggest in the world, with an [annual] capacity of 50 million passengers in Qatar" when it is finished in about 2015, Civil Aviation Authority Chairman Abdul Aziz Mohamed al-Noaimi was quoted as saying. Work on the three-phase project is expected to begin this year. 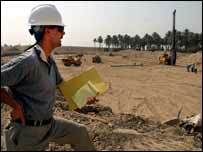 The privately owned San-Francisco-based Bechtel has won substantial contracts in Iraq. This month it was awarded a $1.8bn follow-on contract with the US Agency for International Development.